Home » Cheap and Good? » Question: What other uses do you have for cleansing oils? Question: What other uses do you have for cleansing oils? So I’ve been staring at these 2 bottles of cleansing oils I bought from Shanghai. They are the Watson’s Cleansing Oil and they were on offer for something like 2 for RMB45. I tried one a couple of times and found I did not like it. It is supposed to made from olive oil, and it feels very thick. It goes on the skin and sticks to it, pretty much like how oil sticks to things – you know like in the kitchen? It takes a long time to wash off and even then, does not feel clean. My skin feels sticky and oily after that, and I have to triple cleanse – yes, wash twice with cleansing foam! It actually reminds me a lot of another popular “Deep Cleansing Oil” both in texture, make up and form. Which? It reminds me a lot of the DHC Deep Cleansing Oil, which I tried many years ago and binned within a week because it clogged my pores and broke me out so bad it was not funny. It even has that same dark yellow colour and both are supposed to contain olive oil extracts. I should have borne that in mind, because this Watson’s Cleansing Oil did the same. Clog my pores and break me out. Bad. That said, who knows. 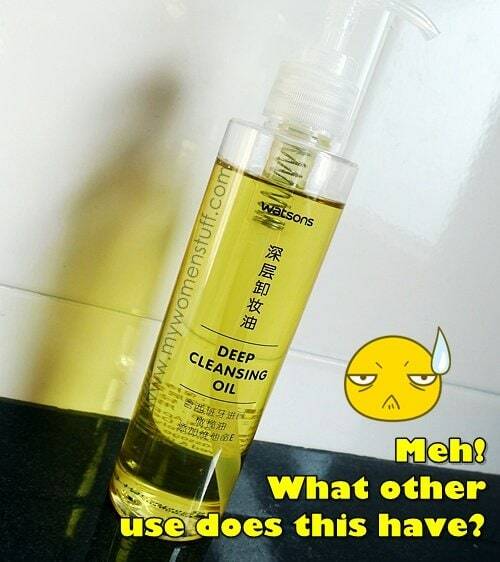 If the DHC Deep Cleansing Oil works for you, you could even find that this one’s a much cheaper dupe! Not that I’m saying it is. Anyway, its now sitting in my bathroom mocking me for being greedy and foolish and too much of a mad scientist. I’m not sure what else we can use cleansing oils for. Any one have ideas? 🙂 Else these 2 will go into the bin. Bleh. PREVIOUS POST: Guess which new BB Cream is in town? I guess it could make nice vinageratte (spelling?) ? I wonder if cleansing oil can be used like a shaving oil. I probably should tried it when I decide to go for the clean shaven look. I read somewhere that you can use cleansing oil to wash your makeup brushes. I’ve done that and it works especially for hard to remove products like foundation. Remember that you still have to wash off the oil with regular soap and water. HTH! hahaha “broke me out so badly it was not funny”. er…i have no idea what to do with it. is there any hapless victim u can try it on? and i like the “meh” face. totally conveys what i feel when a product does not work, for example the much raved about rice water cleansing emulsion from The face Shop, which did absolutely nothing for me, i might as well have used water. meh indeed. can i propose cooking with cleansing oil? 😛 i have no idea, perhaps using as a grease? Lubricant?!! That made me laugh sorry 😉 But I get what you mean. Would have come in handy when I was trapped in my room eh? Hmmm.. maybe to clean off our hands after we swatch with products?? Apparently you can use it as bath oil, not sure if that is useful? Hair mask maybe? But you’d have to wash your hair pretty thoroughly though. Brush cleaner maybe? I had a neutrogena eye/lip makeup remover that I bought and hated, but it works wonderfully as a brush cleaner! use as a diluting medium for oil paints! On another totally irrelevant note, i recently received a 100ml travel exclusive size estee lauder perfectionist cp+ serum as a gift. Do any of u beauty pros here knows how much its worth? I cant find the rm online. maybe to remove sticker marks….? Hmm why don’t you use this to soften ur heels and scrub it after that? It will help on the dryness I guess. U can use it for body cleansing? Like arms and shoulders if u happen to put on water resistant sunblock. Thats an idea! I had a horrible problem once with white residue on my arms after using a thick sunblock. I use cleansing oil to clean my synthetic brushes. It works great for me especially my foundation and concealer brushes. Never use it with brushes that are made from natural hairs though.